First Holy Communion is a day that means a lot to the child and to the whole family. 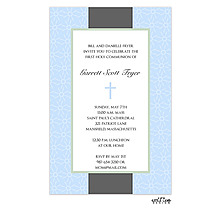 Request an appointment to visit our Attleboro, Massachusetts, location to view our extensive selection of first communion invitations. Online and store prices are the same. A beautiful lace design inspired by a vintage christening gown covers this baptism invitation or birth announcement with meaning. Choose the color of the wording inside for a custom look. Silver filigree and pearlized roses are shown on this invitation. 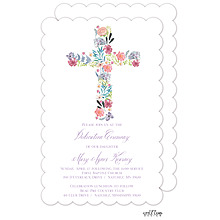 An intricately designed cross is centered at the top of this pearlized border card with your personalization below. Holiness and beauty shine through the pearl and gold design on this cross baptism invitation or birth announcement. The classic design is perfect for a boy or a girl. 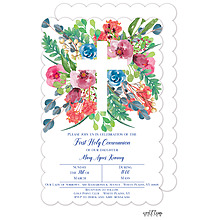 Celebrate your child's First Communion with this momentous invitation. The gold gross and design highlight the information elegantly. 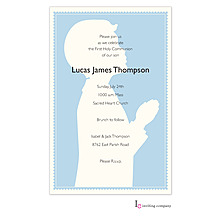 Add your own style to this baptism invitation or birth announcement to commemorate the most meaningful of days. 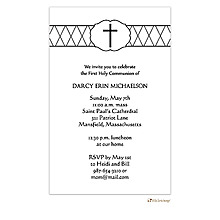 Invitations or announcements are printed with the cross design and your wording in your choice of ink color. 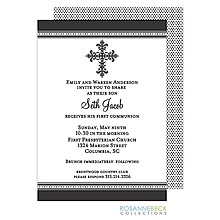 Celebrate your child's First Communion with this momentous invitation. The beautiful art on the sides highlights the information elegantly.